ISLAMABAD, Pakistan (CNN) -- The leader of Pakistan's Taliban, Baitullah Mehsud, is dead from kidney failure, sources told CNN. 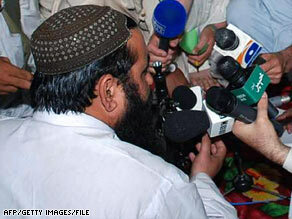 Baitullah Mehsud speaks to reporters in the tribal district of South Waziristan near the Afghan border in May. The Pakistan government blamed Mehsud for the December 27, 2007, assassination of former Prime Minister Benazir Bhutto. An unnamed Islamabad-based source with connections within the Mehsud tribe in South Waziristan said Mehsud died about 1 a.m. Wednesday. Military officials in the field confirmed to CNN that Mehsud had died. Geo Television of Pakistan and other local stations also reported his death. But some reports also had the Taliban denying Mehsud's death. Earlier reports said the leader of the Taliban in Pakistan was ill and was expected to die within a day. Mehsud is said to have succumbed to kidney failure and was believed to be about 34 years old. Mehsud denied involvement in Bhutto's assassination. "We don't strike women," he said through a spokesman. In his first television interview, conducted by Al-Jazeera last year, Mehsud said his ultimate aim was to attack New York and London, England. In January, Spanish police said a cell of Pakistanis -- allegedly dispatched by Mehsud -- arrested in Barcelona was planning suicide operations in Spain and possibly elsewhere in Europe. He led thousands of militants in South Waziristan, the mountainous region of northwest Pakistan that borders Afghanistan and where the Taliban and al Qaeda are active. Mehsud's death would leave a power vacuum within the Mehsud tribe and the Pakistani Taliban, analysts say. Since there was no second in command of the Mehsud tribe, tribal splits are expected. Mehsud's death also is expected to spark a power struggle and the appointment of a new Taliban leader in Pakistan, but whoever replaces Mehsud is not expected to have as much influence and control in the region.